Dear Readers, Take Free Reasoning Ability Sectional Test of 35 Questions as like in the real exam to analyze your preparation level. Our Sectional Test Questions are taken as per the latest exam pattern and so it will be really useful for you to crack the prelims exam lucratively. Students who are weak in Reasoning Ability should utilize this chance constructively to accomplish a successful profession in Banking Field. Direction (1-5): Study following information carefully and answer the questions given below. Eight friends – A, B, C, D, E, F, G and H are going to Delhi on two different dates 11 and 18 of four different months, viz. January, April, May and June. Only one person goes to Delhi on one date of one month. 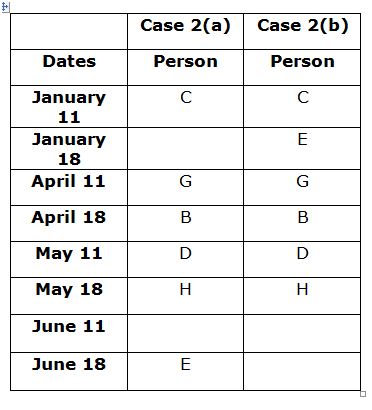 C goes before G. Only two persons go in between E and D. H goes on an even date of the month but not June 18. The number person goes before B is same as the number of persons goes after D. Only one person goes in between H and B. Only one person goes in between C and G. The number of persons goes in between F and D is same as A and H. B goes before H.
1. How many person goes in between C and E? H goes on an even date of the month but not June 18. Only one person goes in between H and B. 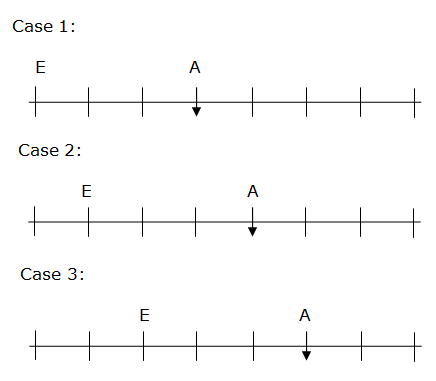 The number person goes before B is same as the number of persons goes after D.
Only two persons go in between E and D.
Only one person goes in between C and G.
From the above condition Case 1 was dropped and case 2 derive further 2 Cases. 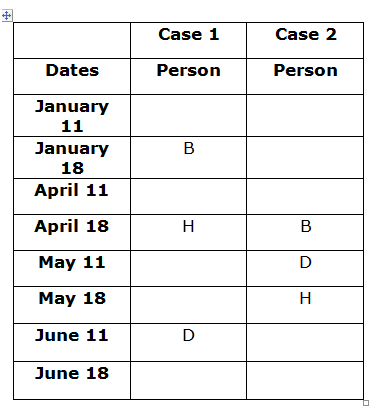 The number of persons goes in between F and D is same as A and H.
From the above condition Case 2(a) was dropped. 2. Which of the following combinations is correct? 3. Four of the following five are alike in certain way and thus form a group as per the given arrangement. Which of the following does not belong to that group? 4. Who among the following goes to Delhi in June 18? 5. 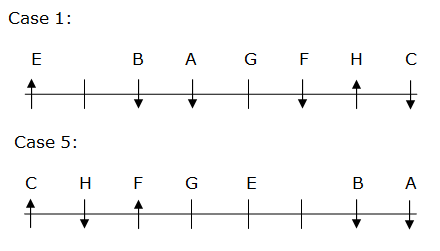 F is related to H in a certain way based on the given arrangement. In the same way E is related to C. Which of the following persons is B related to following the same pattern? Direction (6-8): Read the given information carefully answer the questions given below. a). If the data in statement I alone are sufficient to answer the question, while the data in statement II alone are not sufficient to answer the question. b). If the data in statement II alone are sufficient to answer the question, while the data in statement I alone are not sufficient to answer the question. c).If the data either in statement I alone or in statement II alone are sufficient to answer the question. d). If the data in both statement I and II together are not sufficient to answer the question. e). If the data in both statement I and II together are necessary to answer the question. If the week days starting from Monday to Sunday. On which day does Raghul took leave? Statement I: Kavitha said, Raghul was present on Monday and Wednesday. Kajal said, Ragul does not took leave on any of the days after Wednesday. Statement II: Samir said that, Raghul does not took leave any of the days after Tuesday. Ragul was not leave on first day of the week. From Statement II –> Raghul was leave on Tuesday, so the data either in statement I alone or in statement II alone are sufficient to answer the question. Amir, Bala, Charan, Dhiva, Eswar and Fazil are the six people in the group. Who among the following person got highest score? Statement I: Fazil scored more than Charan, who scored less than Eshwar. Amir scored less than Bala. Statement II: Only two people scored more than Dhiva. Dhiva scored less than Amir, who scored less than Bala. So, the data in statement II alone are sufficient to answer the question, while the data in statement I alone are not sufficient to answer the question. On Which direction does A stands with respect to B? Statement I: A stands 3 meters north of C, who stands 2 meters west of D. H stands 3 meters south of D. B stands 3 meters west of N. N stands 2 meters south of D.
Statement II: N stands 2 meters north of G, who stands 1 meter west of A. K stands 3 meters north of B. 12. How many such pairs are there in the word “PHOTOGRAPHY” each of which has as many letters between them, in the word as per English alphabet order, When calculated in both forward direction and backward direction? Direction (13-16): Study the following arrangement carefully and answer the questions given below. 13. If all the letters in the word are arranged in alphabetical order from left to right, then which of the following word will remains unchanged? 14. If all the letters in the words are arranged in alphabetical order from right to left then, in how many words does the last letter of the word remains unchanged in new arrangement? 15. In the given arrangement, if the letter is a consonant then the letter should be changed to previous letter of the alphabet and if the letter is a vowel then the letter should be changed to next letter of the alphabet, then how many words are framed with minimum one vowel? 16. If all the words are arranged in alphabetical order from left to right, then which of the following word will fourth from the right end? Direction (17-21): Study following information carefully and answer the questions given below. 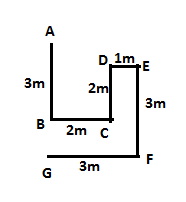 Eight friends –A, B, C, D, E, F, G and H are sitting in a straight line. Some of them are facing north and some are facing south. C sits to the immediate right of H. A is faces south. Immediate neighbours of D faces same directions. C sits second to the left of F. E sits third to the right of A. 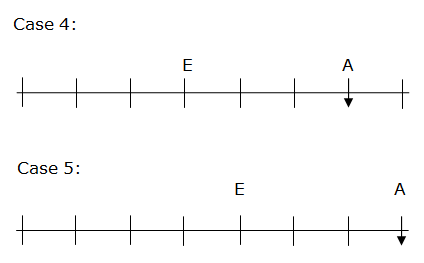 Neither E nor A is an immediate neighbour of C. G sits third to the right of C. E sits second to the right of B. The persons who sit at the extreme ends of the line face the opposite direction. F sits third to the right of D.
17. How many persons sit between C and B? E sits third to the right of A. The persons who sit at the extreme ends of the line face the opposite direction. 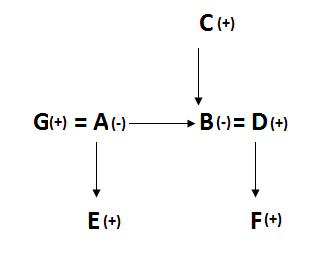 Neither E nor A is an immediate neighbour of C.
G sits third to the right of C.
E sits second to the right of B. C sits second to the left of F.
C sits to the immediate right of H.
From the above condition Case 2, Case 3, Case 4 was dropped. F sits third to the right of D.
Immediate neighbours of D faces same directions. 18. Who among the following sit at the extreme ends of the line? 19. How many persons are facing north direction? 20. What is the position of A with respect to G? 21. Who among the following are the immediate neighbours of B? R < P is true? Direction (24 – 26): Read the following information carefully and answer the questions given below. A stands 3m north of B, who stands 2m west of C. D stands 1m west of E. F stands 3m south of E. G stands 3m west of F. C stands 2m south of D.
24. In which direction does A stands with respect to E? 25. What is the distance between A and G? 26. What is the shortest distance between A and F? 27. If all the numbers are arranged in ascending order ‘256721621431’ from left to right, then how many numbers will remains in original position? Direction (28-32): Study following information carefully and answer the questions given below. Seven seminars- S, T, U, V, W, X and Y are held in seven different days in the same week, starting from Monday and ending on Sunday. Each of them held in different cities, viz. Chennai, Bangalore, Delhi, Mumbai, Hyderabad, Goa and Kolkata, but not necessarily in the same order. Seminar S is held in Delhi. Seminar U held in either Wednesday or Saturday. Only one seminar held between X and the seminar held in Bangalore. Seminar Y held immediately after V. Seminar T held in neither Friday nor Sunday. 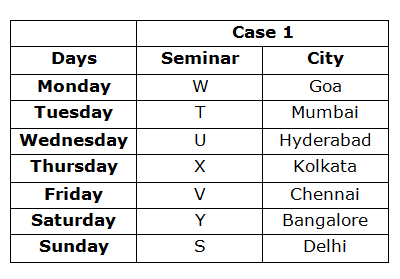 Only two seminars held between S and X. Seminar T is held in Mumbai. 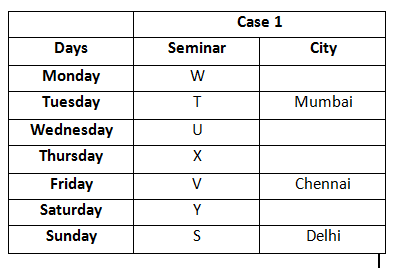 Only two seminars held between T and the seminar held in Chennai. Seminar W is held in Goa. Only two seminars held between Kolkata and Goa. Only three seminars held between U and S. Seminar T held in one of the days after W.
28. Which of the following combination is false? Seminar U held in either Wednesday or Saturday. Only three seminars held between U and S.
Only two seminars held between S and X.
Seminar S is held in Delhi. Seminar Y held immediately after V.
Seminar T held one of the days after W.
Seminar T held neither Friday nor Sunday. Seminar T is held in Mumbai. Only two seminars held between T and seminar held in Chennai. Only one seminar held between X and the seminar held in Bangalore. Seminar W is held in Goa. Only two seminars held between Kolkata and Goa. 29. W is related to Wednesday in a certain way based on the given arrangement. In the same way V is related to Sunday. Which of the following days is U related to following the same pattern? 30. Which of the following seminar is held in Tuesday? 31. How many seminars held between Y and T? 32. Which of the following statements is correct? Direction (33 – 34): Read the following information carefully and answer the questions given below. C is father-in-law of D, who is father of F. A is mother of E, who is son of G. B is sister-in-law of G. C is grandfather of F. C has two daughters. Only two married couples are there. F is male. Not more than seven members are there in a family. 33. How is F related to E? 34. How is G related to D? 35. What is the code for the word ‘UMBERLLA’ The vowels should be changed to next letter of the English alphabet. And the Consonant should be changed to previous letter. Eight friends – A, B, C, D, E, F, G and H are going to Delhi on two different dates 11 and 18 of four different months, viz. January, April, May and June. Only one person goes to Delhi on one date of one month. 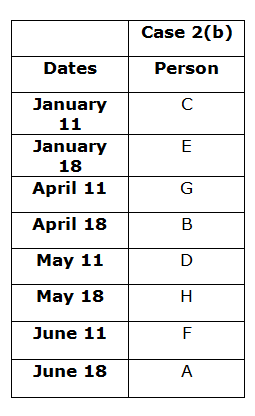 C goes before G. Only two persons go in between E and D. H goes on an even date of the month but not June 18. The number person goes before B is same as the number of persons goes after D. Only one person goes in between H and B. Only one person goes in between C and G. The number of persons goes in between F and D is same as A and H. B goes before H.
1) How many person goes in between C and E? 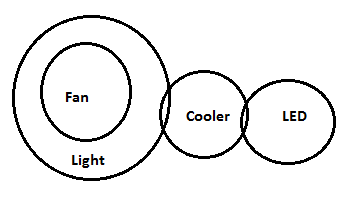 3) Four of the following five are alike in certain way and thus form a group as per the given arrangement. Which of the following does not belong to that group? 4) Who among the following goes to Delhi in June 18? 5) F is related to H in a certain way based on the given arrangement. In the same way E is related to C. Which of the following persons is B related to following the same pattern? 9) If the week days starting from Monday to Sunday. On which day does Raghul took leave? 10) Amir, Bala, Charan, Dhiva, Eswar and Fazil are the six people in the group. Who among the following person got highest score? 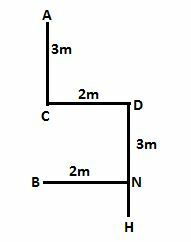 11) On Which direction does A stands with respect to B? 12) How many such pairs are there in the word “PHOTOGRAPHY” each of which has as many letters between them, in the word as per English alphabet order, When calculated in both forward direction and backward direction? 13) If all the letters in the word are arranged in alphabetical order from left to right, then which of the following word will remains unchanged? 14) If all the letters in the words are arranged in alphabetical order from right to left then, in how many words does the last letter of the word remains unchanged in new arrangement? 15) In the given arrangement, if the letter is a consonant then the letter should be changed to previous letter of the alphabet and if the letter is a vowel then the letter should be changed to next letter of the alphabet, then how many words are framed with minimum one vowel? 16) If all the words are arranged in alphabetical order from left to right, then which of the following word will fourth from the right end? 17) How many persons sit between C and B? 18) Who among the following sit at the extreme ends of the line? 19) How many persons are facing north direction? 20) What is the position of A with respect to G? 21) Who among the following are the immediate neighbours of B? Direction (24 – 26): Read the following information carefully and answer the questions given below. A stands 3m north of B, who stands 2m west of C. D stands 1m west of E. F stands 3m south of E. G stands 3m west of F. C stands 2m south of D.
24) In which direction does A stands with respect to E? 25) What is the distance between A and G? 26) What is the shortest distance between A and F? 27) If all the numbers are arranged in ascending order ‘256721621431’ from left to right, then how many numbers will remains in original position? 28) Which of the following combination is false? 29) W is related to Wednesday in a certain way based on the given arrangement. In the same way V is related to Sunday. Which of the following days is U related to following the same pattern? 30) Which of the following seminar is held in Tuesday? 31) How many seminars held between Y and T? 32) Which of the following statements is correct? 33) How is F related to E? 34) How is G related to D? 35) What is the code for the word ‘UMBERLLA’ The vowels should be changed to next letter of the English alphabet. And the Consonant should be changed to previous letter.